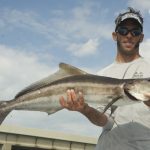 Last Week: Tarpon and Cobia between the storms! Well, the weather made it hard to get out last week, but it did afford us a few windows to get out and get on some big fish! Some early season Tarpon are making a welcome appearance and we have hooked fish on every attempt so far. They have all been in the 50-100 lb. class, which in my opinion are some of the most fun to catch. Spring is officially here. This was my first trip this year using live Greenbacks, and to no surprise all the fish were ready to eat them. 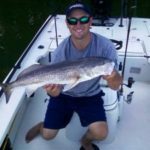 We staged on a flat where the outgoing tide brought all kinds of species out of the shallow backwater, right into my line of baits. 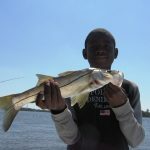 Multiple healthy Snook around 25″ were landed along with half a dozen beautiful Redfish. Well, this last week was a good one to be on the water. 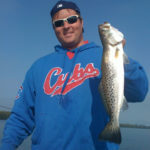 The winds were calm, the water warmed up a bit and the fish are really showing up to eat! 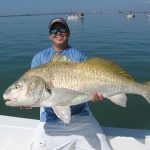 What didn’t we catch this week, Snook, Redfish, Flounder, Trout, and Mackeral all came to the boat on a consistent basis. We ended this week with a bang as I had the privilege of taking my clients Kendall and Kendall Jr. out for a Birthday fishing trip yesterday.